Which brand offers the better variety of toys? 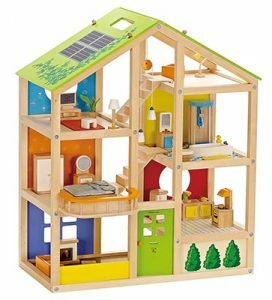 Both Melissa & Doug and Hape have been around since the 1980’s, with ever-expanding toy lines. Melissa & Doug was first known for their wooden puzzles, and you’ll still see tons of them in stores. You’ll find just about any kind of wood toy you can imagine from this brand. They’ve expanded into much more, such as activity mats, activity pads, and art supplies. 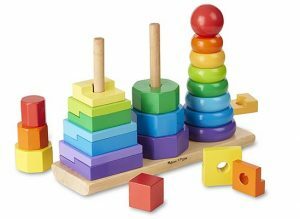 For the sake of comparison, I’ll stick to going over some of Melissa & Doug’s best wooden toys. Wooden Latches Board – A great toy for building motor skills. This features six different latches with groups of animals hiding behind numbered doors. I found the variety of latches to be great; some were easy enough for my kids to open right away to keep them interested, while others provided enough of a challenge they really had to think and work at it. 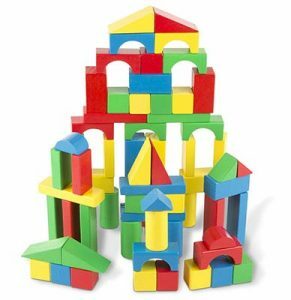 Wooden Building Blocks Set – A pretty big set of 100 blocks at a pretty reasonable price. The color and variety of shapes is great. Very well suited to building towers. 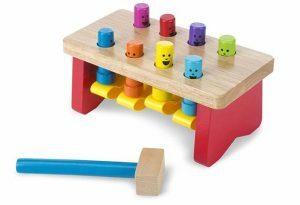 Pounding Bench with Mallet – This is a great variation on the classic peg + pounding bench. When pegs on one side of the bench are pounded in, the other side pops up. The pegs are very brightly colored and have little faces painted on. Another great toy for younger kids to work on their motor skills. See & Spell Board – A box filled with wooden letters and puzzle boards. Each board has a colorful object painted on and recessed letter outlines. Nice for pre-k kids to practice spelling their first words while making a fun puzzle out of it. Geometric Stacker – A bigger and more interesting variation on the classic single stacker. Rings, octogons, and rectangles are included, with the rectangles having two levels that need to be aligned. I like that it offers some added challenge to keep kids from outgrowing this toy too fast. 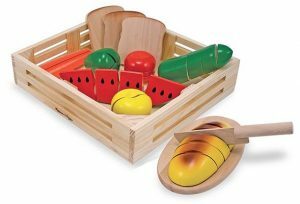 Cutting Food – Melissa & Doug really stand out when it comes to the variety of toy foods. There’s so much to choose from it can be hard to decide. Pizza? Fruits? Pasta? Birthday cake? They’ve got you covered. The favorite of my kids is the cutting set. This features a number of foods such as bread and watermelon that are cut into slices and stuck together with velcro. The included (and very safe) knife and cutting board can be used to slice up the foods. My kids love separating food with the knife and sticking different foods together with the velcro to make funny combinations. 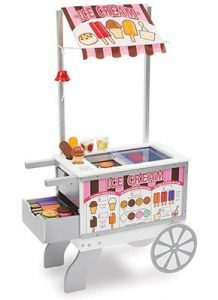 Wooden Snacks and Sweets Food Cart – How cool is this? It looks just like a real food cart, complete with the sliding door on the top and wheels to push it around. If the kid you’re shopping for likes treats half as much as my kids do, they’d go nuts for this. Pretty great stuff, right? That’s just a small sample of what Melissa & Doug have to offer. All Seasons Wooden Dollhouse – I knew I wanted to get a dollhouse for my two girls, and there sure are a lot of them to choose from. They range from tiny to room-filling; reasonably priced to outrageous. After doing a lot of research, I landed on this dollhouse from Hape and have been very pleased. Many dollhouses are sold empty, but this one includes enough great furniture and accessories to fill 4-5 rooms. My kids love the staircases and balcony that can be moved around. The cabinets can be opened, which is fun for putting the smaller accessories inside. The reversible rooftop doubles as a handle to make it easy to move it room to room. 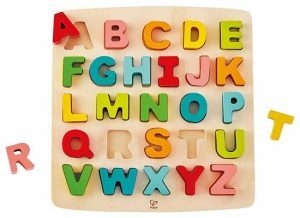 Chunky Alphabet Wooden Puzzle – There are so many alphabet puzzles out there, but this is my favorite by far. All of the letters are thick and colorful. They’re shaped as 3D letters rather than a flat outline with letters painted on. Best of all, each letter has a flat bottom so they can stand up on their own, even “C” and “O.” My oldest daughter still plays with this regularly years later by spelling out words. 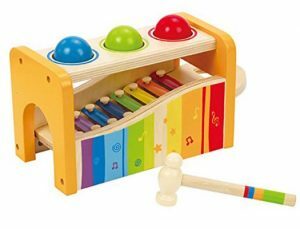 Pound & Tap Bench with Slide Out Xylophone – A great multi-purpose toy. When the colorful balls are hammered through the bench, they run down the xylophone and it make it play a tune. The xylophone can also be removed and played with the hammer. Walk-A-Long Snail – This is our kids’ favorite pull-behind toy. It’s actually a lot more fun than you’d think by looking at the picture. The head and tail bob up and down while it’s being pulled. The eyes are moveable. The shaped blocks match up with holes on the side. When the blocks are inside and the snail is being pulled with its “shell” on, the shell spins and the blocks clunk around inside. Plus it just looks darn cute when a kid is pulling it around. 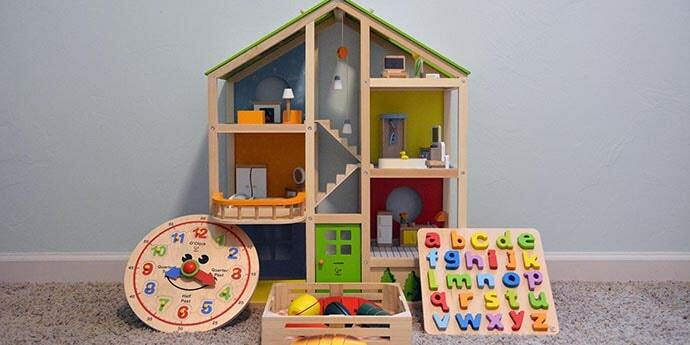 Both brands use hardwood in their blocks and other small to medium sized toys. The durability is excellent from either brand in my experience. Ours regularly get dropped and tossed around on tile floors and barely show any signs of wear. A few pieces of furniture from Melissa and Doug use pine, which is a softwood. This isn’t necessarily a bad thing as it weighs less so kids can move it around more easily. Softwood furniture such as the Project Workbench is unpainted. While it will dent and scratch easier, marring is less visible against the light-colored, unfinished wood. If you’re on the lookout for sustainable wood toys, Hape offers a bamboo line. The selection is a little limited, though. The bamboo line is manufactured in China just as the rest of the offerings from both companies. If eco friendliness is a dealbreaker for you, there are some good options from smaller companies – just keep in mind the cost is higher on average. 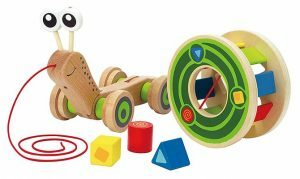 Check out Maple Landmark (made in USA) and Plan Toys for products using environmentally friendly wood, paint, and manufacturing processes. Ever had sticker shock from a big plastic toy with a huge price tag to match? It can be hard to justify spending a lot when electronics or small parts can fail. Sometimes when plastic toys break, they leave you no choice but to send them to the landfill. Wooden toys often give you more bang for your buck since they last so long. Fortunately, Melissa & Doug and Hape both have pretty good prices on their wooden toys. Both brands have a lot of unique offerings, but I’m going to compare some similar ones below to see which is better for the money. Taking a look at the most classic of all wooden toys, we see that both brands have a 100-piece set. The included shapes are nearly identical with rectangles, squares, cylinders, triangles, and domes. They both went with a primary color + green scheme, but Hape adds in some natural blocks for a nice color contrast. Both sets have a very similar feel, with the size of the blocks (1.5″ at the smallest) being well suited to kids 2 years of age or older. 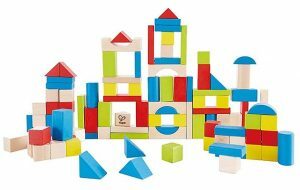 Winner: Melissa & Doug at around $20 over Hape at about $35 for very similar sets. A nice alphabet puzzle is worth taking some time to choose. Puzzles are excellent for early childhood development – they help children learn spatial relationships, shape recognition, problem solving, fine motor skills, and patience. 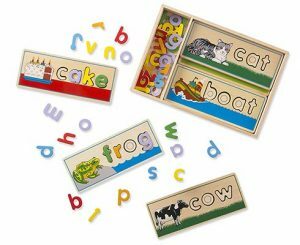 Alphabet puzzles have the added benefit of aiding little ones in beginning to recognize letters. As they get older, kids can learn to speak the letters they see and eventually use the pieces to spell out words. 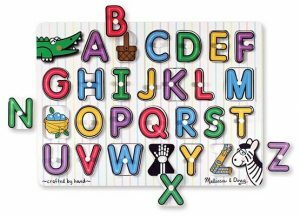 Melissa & Doug alphabet puzzles, like most, have flat pieces. This works well enough and keeps the cost down. The pieces and board are fairly thin as they’re made to fit inside the Puzzle Storage Rack. The See-Inside puzzle has pictures hidden behind the pieces to help kids associate objects and animals with their first letters. If you’d like a puzzle for both upper and lowercase letters, a bigger version is available. Hape takes a different approach with “chunky” wooden letters. These are thick letters paired with a sturdy board. What I love about these letter pieces is that they all have flat bottoms and can be stood upright. When kids are little, they can set them up like blocks. When they get older, words can be spelled out with the letters either lying down or standing up. These letters have a great, solid feel to them and are super durable. Winner: Hape at $20-30 is worth the extra money over Melissa & Doug’s ABC puzzles at $12-17. Kids love pretend play. Foods seem to be the most fascinating pretend toys for young ones to play with. We’ve amassed quite a collection of play foods, and they all get played with regularly. Here I’ve picked two similar sets that both have the added feature of being “cutting” foods. Both sets come with a play knife and several foods split into pieces, with little circles of velcro attaching them. 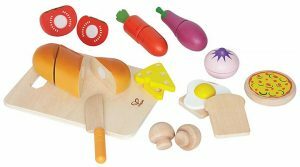 The Melissa & Doug set has eight different types of foods, and each one can be sliced. One thing I like is that many of the foods are split up into 4 or more pieces. This adds to the challenge when the foods are being put back together. The pieces are all sized pretty well with no little parts. The cutting board is a little small but does the trick. The included wooden tray is great – it gives the pieces a home and makes cleaning up toys a little less of a hassle. The Hape set has a similar number of pieces, but not all are sliced. I found the mushrooms and cheese to be a little smaller than I’d prefer for very young kids. The pizza can’t be sliced and is quite little for what it is. The cutting pieces are divided up into 2-3 pieces, which doesn’t offer much of a challenge for kids 3+ when putting them back together. Winner: Melissa & Doug’s set at less than $20 has a tray and better pieces compared to the Hape set at about $25. Conclusion – Which brand is better? Melissa & Doug has a larger variety and is usually a bit lower priced. Certain Hape toys are thicker and have a sturdier feel. The offerings from Hape tend to be a bit more unique than what you’ll find from other brands. I don’t think you can go wrong with either brand’s wooden toys. If it comes down to it, you can choose the one with the lower price and feel confident you’re buying a good product.